Notice the white droplets leaking out of the salmon that's not part of the vanilla cream, originally uploaded by Camemberu. Continuation from yesterday's post. My main course was the salmon confit, something I've never tried before. A beautiful slab of salmon with skin glistening from the herb oil it was poached in. They paired this with a vanilla cream, which is quite unusual (if you can imagine what salmon ice cream might taste like). 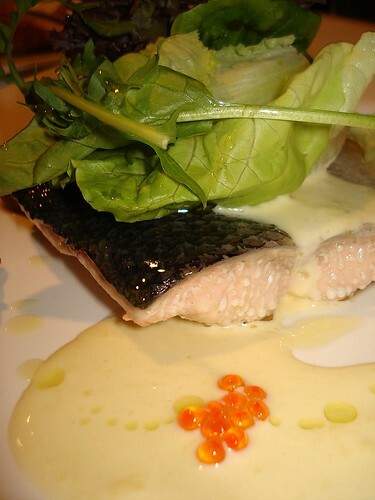 However, you can see that the salmon was overcooked as it was leaking white proteins (albumen). 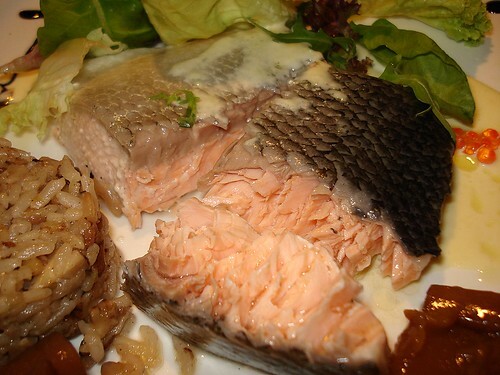 The salmon flesh is soft and fully cooked inside, but still has a strong fishy taste, originally uploaded by Camemberu. Even though cooked, the flesh remained incredibly soft and moist. However, there was one huge letdown. A foul fishy taste so strong, it was as if the salmon had been left sitting on the counter unrefridgerated for two days. Is this the way salmon confit is supposed to taste? Did their salmon supplier do them a disfavour? Or perhaps it is my tastebuds which much prefer salmon a la sashimi, but I've had cooked salmon that taste much better than this. 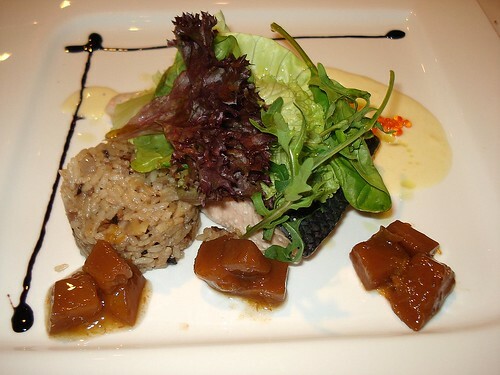 The Chef's Special - herb oil confit Norwegian salmon with walnut and olive pilaf rice, accompanied by organic butternut pumpkin braised in Earl Grey tea, originally uploaded by Camemberu. The salmon made me regret not going for the beef tenderloin or some safer choice. The accompanying items on the chef's special were lacklustre too. A very nondescript walnut and olive pilaf rice. Organic butternut pumpkin that I didn't like but hubby did. Until I told him it was braised in Earl Grey tea, which he hates and is allergic to (it's the bergamot). Well, accents from the tea were very mild, we could not tell unless chewing in full concentration. No allergy reactions afterwards, thankfully. 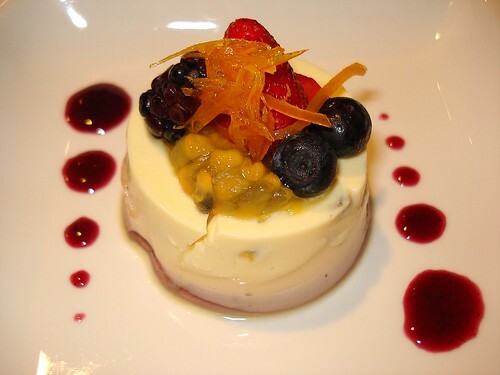 Passionfruit panna cotta, originally uploaded by Camemberu. Although I had lost my appetite after the salmon, we decided to share a dessert. Wanted the creme brulee but it featured rose extracts, the very mention of which gave hubby shudders. 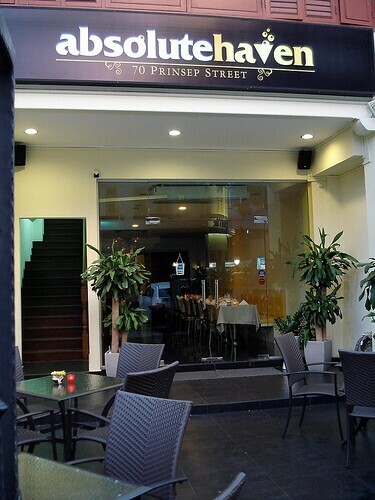 So we went for the passionfruit panna cotta (the chef's special dessert, about S$6). Don't let the cracked and dented appearance fool you, this dessert was not soft, it was very firm in texture. Interestingly it was wobbly too, as it sat atop a layer of jelly. Firm but wobbly, this is an extremely tangy dessert, originally uploaded by Camemberu. Here you can see the jelly better from the back. OK, now this dessert was exceedingly tangy! Hubby thought it too citrusy or sourish but I welcomed the intense passionfruit flavour as it helped wash away the fishy salmon taste in my mouth. 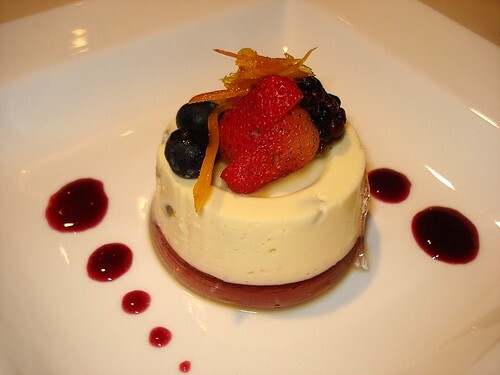 Lovely candied zest of orange and berries added a sweet dimension to the tartness. Well, there was one thing that was really really good at Absolute Haven. It's the coffee! An incredibly rich brew. 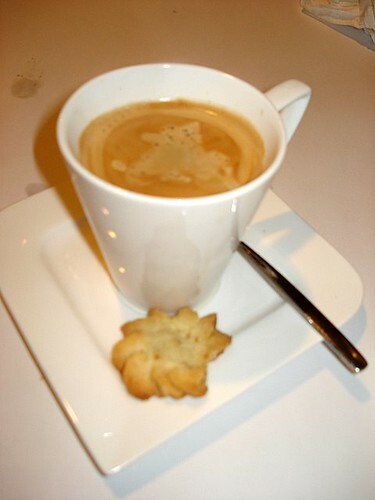 Just the way coffee ought to be. Sorry for the blurry picture. Remnants of Nadine's fingerprints are still on the lens, so it doesn't focus properly these days! There's a nice al fresco area for dining under the stars, originally uploaded by Camemberu. OK, so we came away with mixed feelings about this place. Nice ambiance. Cosy little shophouse right next to Roomful of Blues. But the food is a huge gamble. In their attempt to be innovative, they end up serving food that may not please everyone. The waitstaff are excruciatingly polite and attentive but you can also see how nervous they are. I'd say while it is commendable that the folks at Absolute Haven try very, very hard, they absolutely haven't got it down pat yet. This is really just about the coffee since I've noted that most places don't have even decent brews. The ones that I had from The Song of India are pretty good. Strong stuff too. Despite the nice looking tenderloin that everyone else seems to be putting up, I still haven't gotten myself down to this place. oh dear your piece of salmon really looks overcooked! but mine wasn't though..it was more like "medium rare". Ice, I don't mind overcooked but I do mind FISHY. Liquidshadow, it'll be interesting to see your take on the joint. Sometimes, I think the taste of salmon depends on how its cooked. I've cooked sashimi (couldn't finish it, so I cooked it a few hrs later) before, and it still tasted a lil fishy! 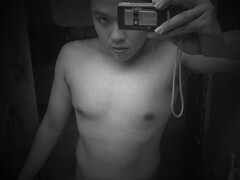 hahahah! i also went to absolute, but haven got the time to post on it yet. and yes i have the salmon same as you also. but i find it to be all right. mine wasn't really overcook i guess.